As in previous years, the union’s most prominent non-economic demand was stronger affirmative action, a proposal that was strengthened by the creation of the Attorneys of Color of Legal Aid (ACLA), a caucus formed earlier in the year with the union’s strong support and initially co-chaired by Sallie Manzanet (Bronx CDD), Millie Pinott (Volunteer Division) and Magda Rosa-Ríos (Volunteer Division). Management, however, remained intransigent on affirmative action, and refused, even after the contract expired on October 1, 1990, to make any economic offer. ALAA responded with public rallies on October 1, informational pickets, an invasion of the Society’s October 23, 1990 annual meeting and disruption of Management’s Christmas party at Park Row. In December 1990, two months after contract expiration, the Society finally made its economic offer: reduced attorney health benefits and no wage increase — the equivalent of a net three percent union give-back. Management claimed poverty, but, as in the past, refused to reveal how the Society allocated its $120 million annual budget. The Society answered by threatening to terminate health coverage for any attorney who refused to authorize payroll deductions toward the cost of insurance premiums. When, in late-February, attorneys voted 515-138 to reject this ultimatum, the Society unilaterally cut the benefits. ALAA was now faced with a dilemma. Its members regarded health give-backs as unacceptable. Most attorneys, however, were understandably reluctant to strike. 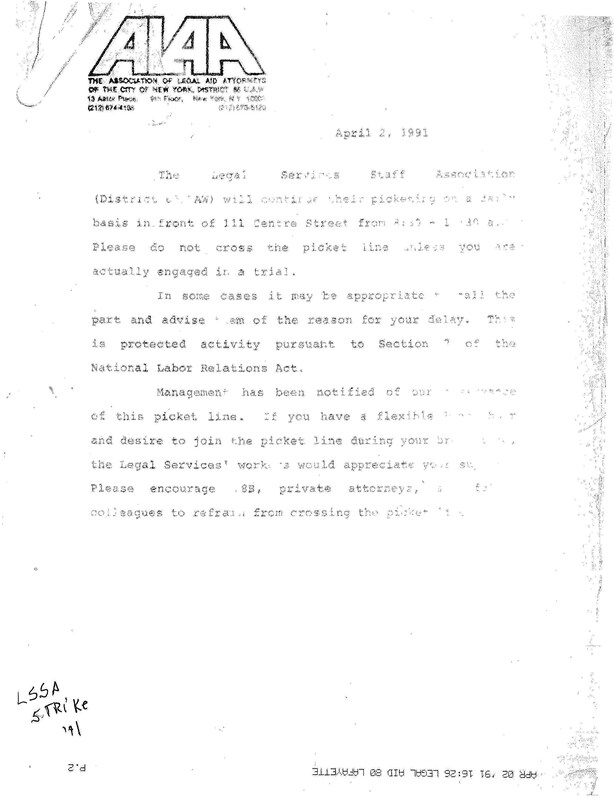 By early spring, therefore, the union implemented an alternative strategy of resistance based on “inside”(9) and corporate campaigns that included picketing the law firms of Legal Aid Board officers and bombarding Board members’ clients with a mass letter writing campaign. Having failed to buy off the union, Mollen suggested then that the Society compromise on ALAA’s economic demands, thus undercutting management’s insistence that the city would not permit it to exceed the pattern of municipal labor contracts. When the Society hemmed and hawed, the union vowed to disrupt Legal Aid’s April 24 fund-raising dinner at the Waldorf-Astoria Hotel. Under this threat, the Society offered to restore essential health benefits, rescind unilateral employee deductions and, for the first time ever, guarantee existing benefit levels for the life of the contract. Except for a small increase at Step 13, however, salaries were frozen. In other areas, the Society agreed to landmark improvements in job security, equal benefits for lesbian and gay attorneys, and health and safety. When compelled by management’s terms to “recommend” the offer as a condition of allowing the membership to consider it, the Bargaining Committee achieved ratification by 267-162 — but only on a basis that unilaterally repelled the Society’s last-minute attempt to renege on its economic offer and to coerce ALAA into dropping a Civil Division affirmative action grievance. Although the union had successfully endured, these difficult contract negotiations served to undermine members’ morale. Deeply concerned about health benefits, salaries and other working conditions, and without a prepared strategy, ALAA had ended up divided about how — or even whether- -to resist Management, a schism reflected within the Bargaining Committee. 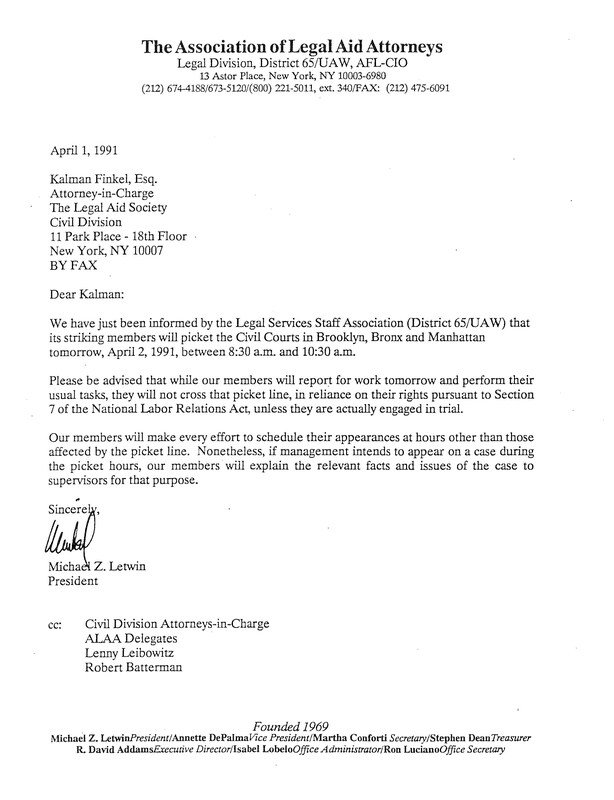 On the other hand, contract negotiations had generated greater membership activism and broad agreement on the need for unified strategy in 1992. 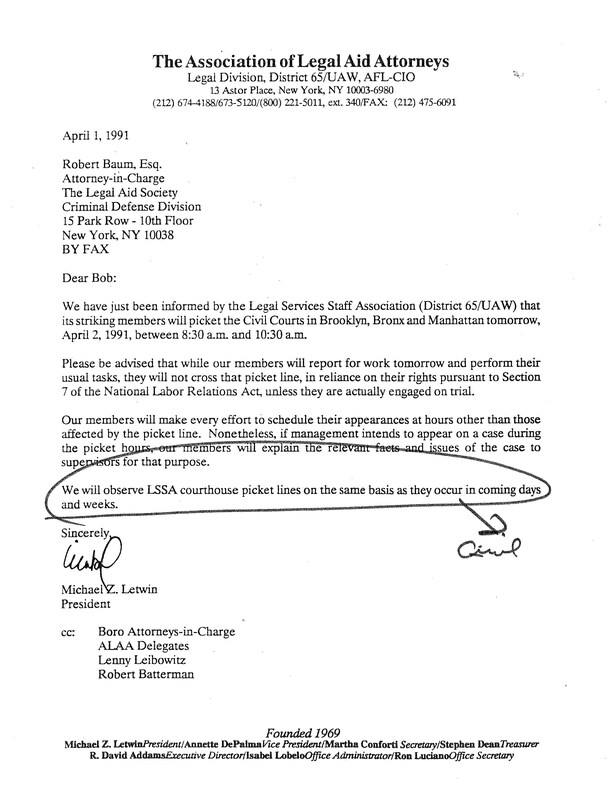 We have just been informed by the Legal Services Staff Association (District 65/UAW) that its striking members will picket the Civil Courts in Brooklyn, Bronx and Manhattan tomorrow, April 2, 1991, between 8:30a.m. and 10:30 a.m. Please be advised that while our members will report for work tomorrow and perform their usual tasks, they will not cross that picket line, in reliance on their rights pursuant to Section 7 of the National Labor Relations Act, unless they are actually engaged in trial. Our members will make every effort to schedule their appearances at hours other than those affected by the picket line. Nonetheless, if management intends to appear on a case during the picket hours, our members will explain the relevant facts and issues of the case to supervisors for that purpose .